Weather was, Tough, Tougher, and beautiful starting with several cold fronts having lows at 32F and one day it was still 48F at 2PM with a strong wind. By the weeks end it turned sunny having highs in the mid 70’s. Horace Philips from Oklahoma City, OK returned with his son & group of 12 friends Perry, Steven & Ethan Culpit, Bob Murrell, Tom Green, Barry Bennett, Tim Turner, Van Shelton, Keith Mitchell, & Dan Jollif all from the same area o Edmond, Newcastle, Moore, & Okarche plus a few from Canyon & The Colony, TX. 1st day was just coming off cold front conditions so the fishing was slow but by evening this turned around with Tom, Barry, & Perry getting into some nice Smallmouth Bass & Pike after supper. 2nd day this group did very well with Horace & Dan alone catching over 35 Smallmouth all BIG including Horace with a HUGE 21” Trophy plus 20 Northern Pike, keeping my Tackle shop busy after supper. 3rd day was gangbusters as all caught lots of Smallmouth Bass & Northern Pike, with 3 of their 5 boats catching 40-50 Smallmouth each, most being 16-19”. Tim & Perry had a fabulous day catching 131 Northern Pike. 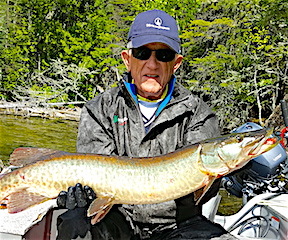 4th & final day was a continued effort from day 3 some catching 30-40 Smallmouth Bass between 15-19”, many pike being caught, Perry caught a Muskie, and the biggest catching was had by Bob as he landed two Muskie, 37” and 38”. Plus two Pike measuring in the 35-36” zone. All left having a blast with all intentions of returning. of the Trophy SB & commented that he never thought it possible to catch that many big fish in 1 day. 2nd day was 18 Northern Pike, 6 SB. 3rd day while struggling through a cold front they still managed to catch 12 Pike & several Smallmouth Bass plus Paul had a very exciting time landing a 28” Tiger Muskie on 6lb test while jigging for Bass. 4th day they caught over 30+ BIG Smallmouth Bass, including several Trophy fish, each landing a 19”er. 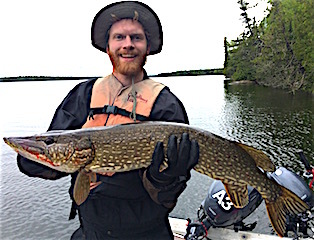 Chris also caught his 1st ever Northern Pike fly-fishing, a nice 28.5” fish. 5th day was a portage lake adventure for Pike catching over 30 & Chris accomplished his goal landing 10 Pike in a day Fly-Fishing. Final day had them catching 28 bigger Smallmouth Bass with just a few shorty’s mixed in, several Pike up to 30” & the BIG surprise was Chris hooking into & landing a HUGE 33” Lake Trout. Chris left having a great 1st experience and Paul counting his days down until his return in August. Ken Elmhurst, IL with son Kenny Heflin, Berkeley, IL retuned for the 7th year with Ken’s brother Dennis 1st timer, 2nd timer Anthony Miceli, Somonauk, John Healy, Franklin Park, & Lon Adams, Sandwich, IL both 1st time at Fireside Lodge. 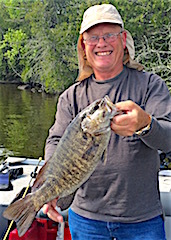 Ken set the pace for the group catching many Smallmouth Bass 14-16” several 17.5” and an 18” Trophy on the DOA. Ken & Dennis did the best on the 1st day catching many 17.5” Smallmouth Bass & Dennis had 1 Trophy over 18” & Ken caught 3 more. This whole group had a special 2nd day catching lots of Smallmouth Bass between 15-19”, Anthony & Lon landing 7 Trophies over 18”, Ken having 3 more with 1 at 19”, and John also had a 19”SB. 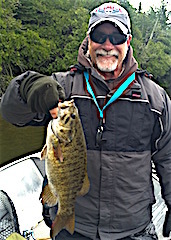 Their 3rd plus 4th & final day were full of Smallmouth Bass action catching countless fish between 16 – 17.5”. Total they caught 28 Trophy Bass between 18 to 19.5 inches. 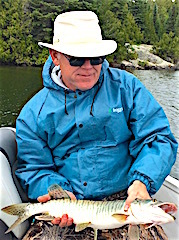 John also caught his 1st & 2nd Muskie and Dennis landed his 1st. All had a fabulous time making many fishing memories together. 3rd time return guests Dan Garry, Willoughby, OH & Neil Newman arrived 1 day before the other 6 members of their group and did well catching 12 Northern Pike in the 30” or better class fly-fishing. Second day these two had 12 NP by supper before the rest of their group members arrived, Mike Pece, Paul Cardinale & Son Paul from Solon & Mentor, OH Mike Stauffer, Rod Dennison & Dave Caldwell all from the greater Cleveland, OH area. 1st day for the whole group was slower mostly due to the cold windy day only having temps of 48F at 2PM. For their 3 day stay fishing was good and very good for some, with Mike P landing a number of bigger Pike, Mike S & Dave catching numbers of Pike, Paul & Paul Jr catching 18 in one day & Dan & Neil caught more 30+ Fly Fishing. Neil commented that he had a 4ft+ Muskie open its mouth ready to inhale his fly but turn away at the last second. This would have been a record at Fireside Lodge for a Pike on the Fly. All left having a wonderful stay and plan on return visit. 2nd Time Return guest Lewie Barber and fishing buddy Ron Baker from Austin, TX started off on the day of arrival with 6 Smallmouth Bass, Ron with 2 over 17” plus a Trophy 18.5”. 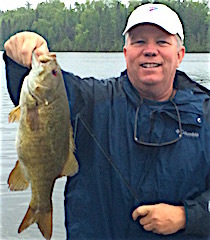 1st day was good action for Smallmouth up to 15”. 2nd day they caught a lot of Smallmouth up to 17”. 3rd day had them catching 4 Pike plus many Smallmouth Bass including a number of 15, 16, 17 inches & Ron caught his second trophy Smallmouth Bass over 18 inches. 4th & final day was great for Smallmouth with Ron landing his 3rd trophy Smallmouth bass at 18.5 inches plus many more 15-17”. The big bonus was Lewie getting excellent pictures of an adult eagle in the neat with the eaglet. Amazing photo, which is the first captures for the 27 years Audrey and I have owned Fireside Lodge.